"Days In The Wild" and "The Hunting Channel Online"
My good longtime friend, hunting advocate and sportsman. Zac Griffith is a premier hunter, sportsman, and outdoor video producer. 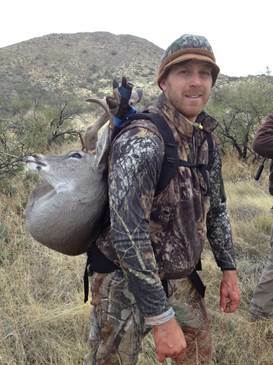 Zac is the Managing Editor of Muley Crazy Magazine, and is national Pro-Staff for many sporting and hunting products. I have had the pleasure of working with Zac to provide him with painting several of his ASAT bows. "No Regrets Outdoors" and "Train-to-Hunt"
Matthew Ament is a video-journalist, avid hunter, and sportsman. Matthew's fitness work with "Train-To-Hunt" has help him become a hunting fitness icon within the bow hunting industry. He is on the Promotional Teams for leading products such as Arizona Archery Club, Kryptek, Kifaru, Bee-Stinger, GoldTip, Plano, S4Gear, Bad Medicine Archery, No Limit Archery, Fish People Seafood, Hips Archery Targets, Kenetrek Boots, Motion Camera Arms, The Hunting Channel Online, Train to Hunt, and Crossfit Forbidden.